just a small bit of help from photoshop. 3 photos set in panoramic mode and put together with the canon photostitch program and cropped in photoshop. this is a great reason to stay after the sun has set. I would have to disagree with Mactek. I think the stitching/blending has worked properly. The difference in density in different parts of the photo is due to the darkness of the clouds. My question is, did you do any color enhancement in PS? It looks too red to me. I don't think I have ever seen a sunset that red. I have seen beautiful sunsets all over the south Pacific and much of the USA and the were more orange. At any rate it is a great shot and a great job stitching. 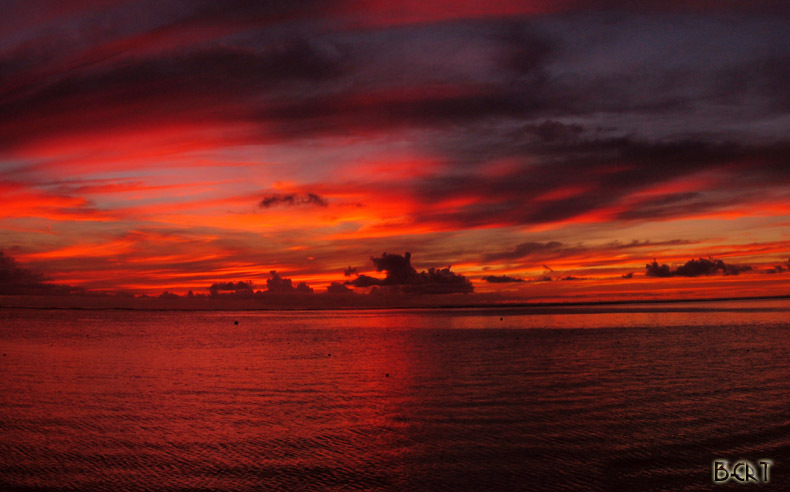 Keep this up and I might even move to Guam..... Haven't seen a red sunset like this recently in Hawaii but they are exactly what your shot portrays.